Just like our garage doors and openers, our support is the best in the business. Some say that our support puts the “genuine” in our motto, “The Genuine. The Original.” because we truly care about our customers and do what i​t takes to make sure you are satisfied with your Overhead Door™ products. View the wireless programming instructions by selecting your model. Should you need additional information about installing or programming your garage door opener or remote, use our Service & Support to locate a representative in your area to assist you or call our customer service at 800-929-3667. Select a model to view the programming instructions for that particular wireless keypad. Press the button with the arrow up/down triangles. Press and hold the PROG button. Keep holding and proceed to step two. Press and hold the 6 button. Keep holding and proceed to step three. Press the key with the arrow up/down triangles. Press the following keys in order: 3, 5, 7, PROG (red LED blinks once per second). Enter your PIN (three to eight characters). Press the PROG key again (red LED blinks twice per second and turns off). 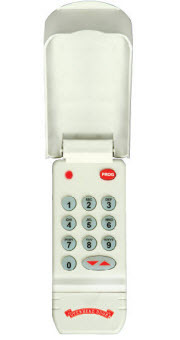 For convenience, program your keypad before mounting.If programming your garage door opener is disrupted at any point due to program failure, clear/reset your keypad. Then, start over. Locate the “Learn Code” button and the “Learn Code” red LED indicator. Press the “Learn Code” button once (red LED indicator will blink). Press the button with the arrow up/down triangles. The “Learn Code” indicator LED will stay on. Press the button with the arrow up/down triangles a second time. The “Learn Code” indicator LED will turn off. Press the button with the arrow up/down triangles a third time. Garage door should now move. Enter your PIN and press the PROG button (red LED blinks once per second). Press the PROG button a second time (red LED blinks twice per second). Press the total number of doors you wish to control (either 2 or 3). Press the PROG button a third time (red LED blinks several times and turns off). Decide which door will be Door 1, 2 and 3. “Learn Code” indicator LED (on opener) blinks. Enter your PIN and press the arrow up/down triangle button. “Learn Code” indicator LED continues to blink. Press the number you have picked for this door opener: 1, 2 or 3. “Learn Code” indicator LED stays on. Press the arrow up/down triangle button a second time. “Learn Code” indicator LED turns off. Press the arrow up/down triangle button a third time. Garage door should move. Repeat steps one through five for programming each garage door opener. Each door opener must be programmed to receive the signal from the wireless keypad. If the garage door does not move, check the red LED on the keypad. If the LED blinks rapidly, the PIN was entered incorrectly. Any keypad button will control the door for 30 seconds after the door starts moving. Rapid blinking of the LED indicates an error. After a few seconds, the LED will turn off, and you can retry. If the red LED does not blink during use, the battery needs to be changed. Drill a 1/16" hole for the top mounting screw. Install a screw into the top drilled hole, leaving a 1/8" gap between the screw head and the wall. Mark the bottom hole, then screw in the bottom screw. Proceed to the Mounting Instructions. The keypad must be mounted in sight of the door(s), at least 5 feet above the ground and clear of any moving door parts. Mounting screws are located inside the battery compartment. Drill a 1/16" pilot hold for the tip mounting screw. Install a screw into the drilled hole, leaving a 1/8" gap between the screw head and the wall. Enter your NEW PIN and press the PROGRAM button. A temporary PIN allows temporary access to your home by repair persons, meter readers, etc. Enter your current PIN and press the PROGRAM button 3 times. Enter your temporary PIN and press the PROGRAM button. NOTE: Do NOT reprogram the garage door opener(s). Temporary PIN remains active only until the next time your normal PIN is entered. While holding the PROGRAM button, press and hold the UP/DOWN button for 5 seconds. Release both buttons. 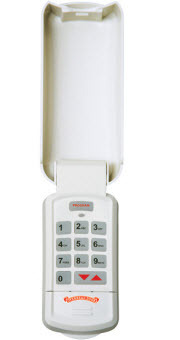 You must now start from the beginning and reprogram you wireless keypad. If the keypad backlight does not come on, this indicates the need to replace the batteries. Press in on the front of the battery cover and slide it down off of the keypad. Remove used batteries and replace with "AAA" batteries.